Hello Lovelies! The sun has finally decided to show its face, and again it is really starting to feel like Summer (let's just forget about the week of rain and jumper weather!). And yeah, British people really are a bit too obsessed with the weather... Today I wanted to do a really bright and happy selection, because to be honest I've just been in a really good mood lately. Picks are from M&S, Temptationgifts (happyjackson), Oliver Bonas and House of Fraser. Enjoy! 1. Alphabet R Cushion £15.00 [x] : I feel like you'd never expect it from M&S but they honestly have some great homeware bits and bobs, and not just super yummy food. I'm in love with their alphabet cushions which each have a different design for every letter - plus they are super affordable too! 2. Linea Large Yellow Pineapple Bowl £12.60 [x] : I think I may have just found the best Summer bowl guys, like seriously how fun is this? It would make the best fruit salad bowl ever! 3. Wall Mounted Parrots £19.50 [x] : Ok, you have to be kind of bold to introduce these into your home but aren't they so cool? 4. Citrus Salt and Pepper Shakers £12.00 [x] : There are so many novelty salt and pepper shakers on the market, but I love these cute ones from Oliver Bonas. Perfect for a bit of a Summer makeover. 5. Cactus Ring Holder £15.00 [x] : I actually think it's ridiculous I'm featuring another cactus on the blog, but there is just so much cute cactus homeware at the moment. Plus isn't this just the cutest ring holder? 6. Happy Jackson Large Pet Bowl £9.95 [x] : If you have a dog, you will probably appreciate this pet bowl as much as I do. Even though Molly won't understand it, I kind of totally want one. Thank you for reading lovelies - I hope you have an amazing week! I've always wanted to have an alphabet cushion! loving the cushion! the poms poms are sooo cute! It took me a moment to noticed that was a cactus, I thought it was some naughty thing...can you say my mind is in the gutter? I don't even wear rings and I want that cactus ring holder, so cute! I say yes to ALL of these! 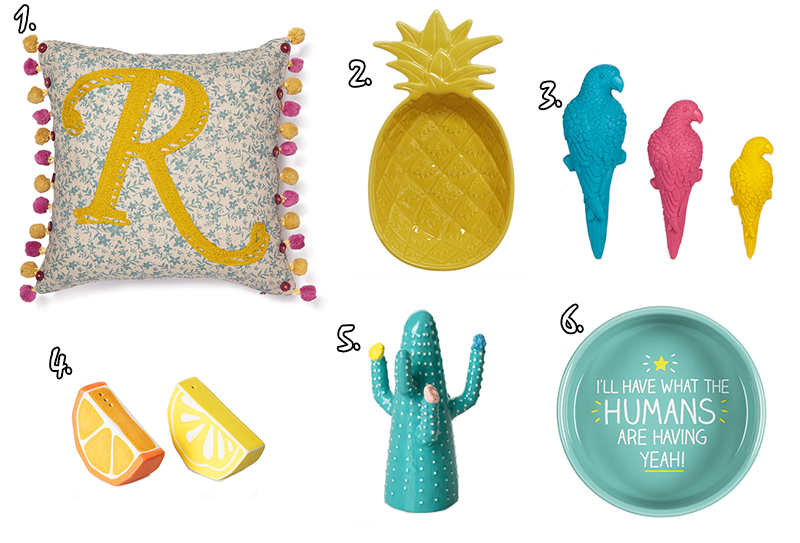 Especially that pom pom pillow, pineapple dish, and that adorable doggy bowl!! I adore the pineapple bowl! I'm going to be redecorating my room and I'm really into the bright tropical theme at the moment so this post was perfect!